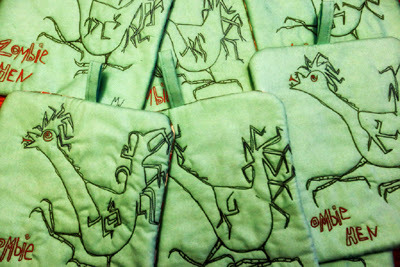 Maria Wulf posted her Zombie Hen Potholders (see above), and although they are all sold out, they are not to be missed! How fun and silly they look. Interestingly she has posted them on a morning when I seemed to have snapped too! 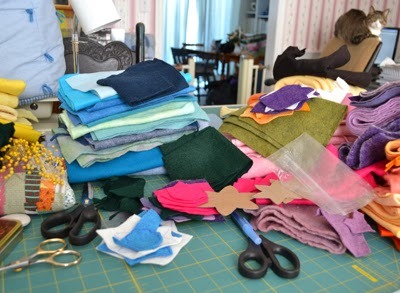 I have been cutting out multiple projects, usually one of my most favorite activities. 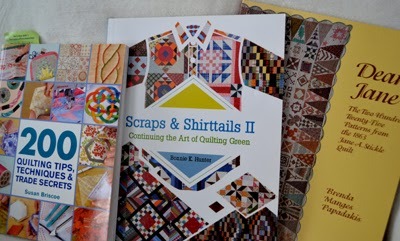 I treat it like a yoga exercise and enjoy sitting in front of the TV as I do it and "getting into the zone" playing with colors and textures of fabrics. Today I am out of the zone completely and seriously considering my girlfriend's offer to escape to sunny California. Oh, I forgot, I am still in a treatment that doesn't allow for soaking up Vitamin D from the sunshine. My daughter imitates Madame Mim from The Sword in the Stone, as she giggles and repeats her favorite line to remind me of my plight, "I haaaaate sunshine!" She does it for me to make me laugh at myself when I get Zombie-like from the lack of it! 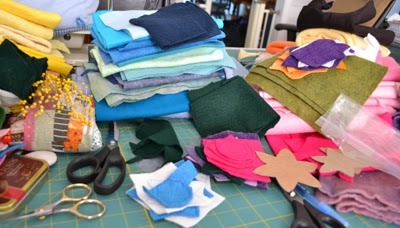 I have just been to the quilt store and pulled out all sorts of fabric and thought I was inspired enough to make it through the rest of this season's snow storms! I even made my "Sunshine Soup" yesterday, one of my favorite soups, full of veggies, and here I am today, a Zombie Artist....without a speck of creativity and fabric is the last thing I want to see, though it is everywhere! 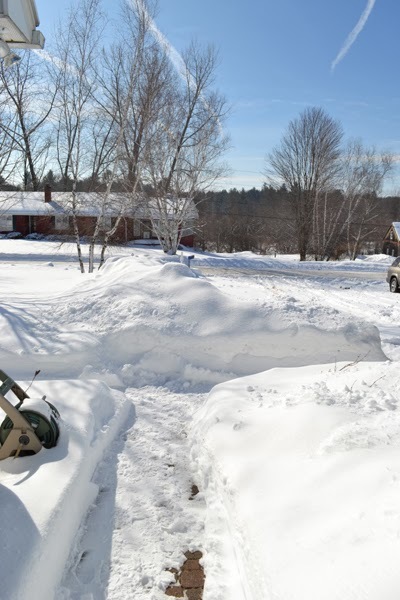 Fortunately this doesn't happen too often, and it might be due to the fact that I have coupled my cutting activities with cleaning out the basement, even though I have planned it to be a twenty-three day project, spreading out this dreaded task into tolerable mini doses! 1) Nap?...I just got up after a full night's sleep, so onto the next suggestion..
2) a sewing or cutting bee or in front of a good TV program?....Yeuk! 3) Moodle to get new ideas?.... Done yesterday! 4) Pick up house and have a visitor?...house just done, except for the dreaded basement, and a visitor--Not today! 5) A beauty bath? likely a good choice...what is that I am smelling? Yes, it is definitely time to add bathing to my list for the day, but all day? 6) Exercise? Another need and I just read that too much sitting will lead to disability! Too little knowledge, too late and too cold and nasty out to get to the pool, leaving exercise to an in-house cleaning activity--NOT fun, but definitely needed! OK, a minimal amount of time in the basement added to my list. 7) Clean pantry shelves to make a creative dinner? I still have some Sunshine Soup as I cleaned out the refrigerator yesterday! Too much of the same for today, no way! I think a ham popped in the oven will smell nice. I will add that to the list. 8) Learn something new today? 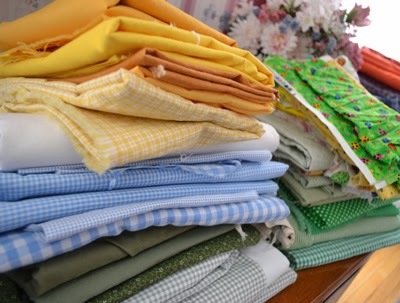 There IS much I want to learn about the quilting I want to do soon and so that will be added to the list too! 9) Pray? Definitely needed to elevate this funk! 10) Do a random act of kindness? Would it be kind to call someone today with the mood I am in? Very questionable, though I do have a friend who is a young mother, trapped in her house with five kids. Perhaps she would consider it kind of me to call and ask about her issues and listen to her, besides which I will feel better in knowing that I am NOT trapped in my house with five kids! I will add that to my list. So there is my day all planned out: several stints of going up and down steps for exercise, likely to and from the basement's twenty-three day on-going cleaning project, a beauty bath as I smell ham roasting in the oven, learn something new about quilting, pray for my mood to be elevated, and call my young housebound-mother-friend and listen to her issues, a given with her load. 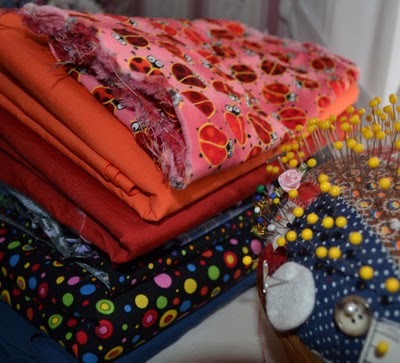 Then feeling better about my circumstances, perhaps I can then plung into the more mundane projects of cutting and pressing materials for sewing and quilting to prep for a day that I feel more creative! 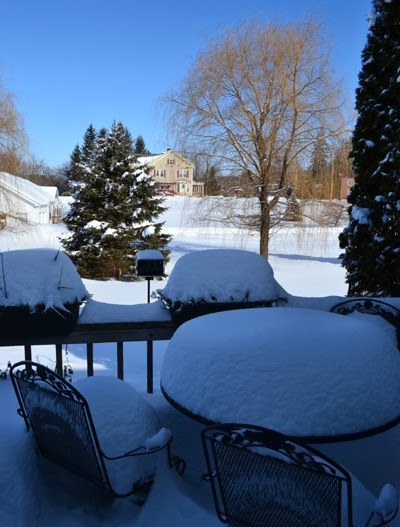 I will even treat myself to a bowl of my left- over Sunshine Soup for lunch, perchance to dream of sunshine to melt all our snow! Throw into a pot: browned hamburger, sauteed onions, fresh vegetables (clean out your refrigerator--carrots, cabbage, celery--it doesn't even have to be crisp!) and then clean out your freezer--mixed frozen veggies or whatever sort you have left), peeled and diced potatoes, canned crushed or diced tomatoes, beef broth, and then add spices: salt, pepper, red pepper,a bit of curry, parsley, garlic and Italian seasonings (marjoram, oregano, rosemary, thyme, savory, sage and basil) and let simmer in the oven until fresh carrots, and potatoes are cooked. Serve with a slice of bread slathered with butter for a soul-warming cold winter's day meal!